They put the "i" in iconic, this special couple, and by definition they also put the "we" in it as well. They are none other than Ma Nishtanah and Pa Rumpumpumpum, two halves of show business’ happiest mixed marriage, now together for over 35 years and still proving exactly what it takes for people of different backgrounds to forge a lasting and loving relationship. 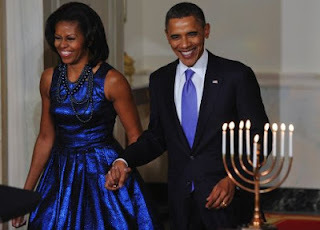 And it was our privilege at Parade Magazine to visit with these lovebirds just as we did last April as the two prepared to celebrate one of the major holidays of their two disparate traditions, the eight day Feast of Lights called Hanukkah. "She's driving me crazy with all this Hanukkah crap!" said Pa, greeting us warmly at the door. "Right now she's stinking up the place frying those Jesus H. Christ latkes!" Budweiser in hand, Pa ushered us into the kitchen where Ma was assuming a familiar position, bent over the stove and staring disapprovingly at Pa.
"Welcome to our happy Jewish & whatever the hell religion it is he is home!" said Ma. "You're just in time for some fried latkes, a Jewish tradition!" "Latkes," said Pa, "the Jewish answer to coronary heart disease. Until we fumigate I can't even enjoy my six- pack and mayonnaise sandwich!" Sadly, Ma's first marriage to the dapper but dissolute Irwin “Buddy” Berenson foundered when Buddy gambled away all her money and personal possessions and began extracting teeth and internal organs at night while she slept. Eventually he owed so much money to the mob that he went over the fiscal cliff in a manner that would have had John Boehner really crying his eyes out! Eustace Rumpumpum came out of a dirt-poor Arkansas town to score a number one hit with "A Grover Norquist Christmas," followed up by "Jesus Loves Me, But I'm Against Gay Marriage" and a tender ballad to his first wife on the eve of her hysterectomy "Stand By Your Glands." Unfortunately Eustace's marriage to former hair dresser Tammy Lynette Hairnette ended tragically when he came home one afternoon to find her discussing economic and political theory with Paul Krugman. Devastated, Eustace added a third "pum" to his last name and began calling himself "Pa," both for no discernible reason whatsoever. Despite prior heartbreak, when the disenchanted and lonely Ma and Pa finally met it was a magical, mystical kismet! "I was hoping for a big shlong this time around," said Ma. "And I wanted to corrupt and degrade a Jewess," added Pa.
"How about we play some dreidel before we light the menorah? "Ma asked us. "Dreidel?!" said Pa. "That has to be the most boring game since Uno for the Colorblind!" "Well, then let's sing "Dreidel, Dreidel, Dreidel," suggested Ma. "That's even lamer than "The Little Drummer Boy!" said Pa.
"Well, what's better, Mr. Jesus-of-Nose-Hair-Breath?" "And here's your Christmas present early, Pa!" said Ma. "The Second Amendment 2013 Pin-up Calendar!" And both of them then melted into each other's arms! *Ma Nishtanah is the beginning of the central prayer of the Passover Seder known as "The Four Questions." Ma Nishtanah's sisters, by the way, are Lilo Hazeh and Nicole Halaylos. We'll explain those another time. I just love it when Jews and Christians and reconcile their differences without boring me to tears. Perhaps they can bring their off-Broadway show to the Ozarks (The Great Passion Play is for sale)and play before a standing room only crowd of 4 hillbillies, 3 brush goats, 2 nuetered politicians, and a wild turkey in a collectable decanter. BTW-I want a back-stage pass if you can arrange it. Most people WERE bored to tears, so thanks for your response, Russell. An off-Broadway play would be great but where are we going to find all those hillbillies, brush goats, and so forth in a collectible decanter? And who is going to neuter the politicians? Heart-warming except for the mayonnaise sandwich idea. I actually heard of something like that being eaten by someone otherwise raised on 7-11 food. I don't know where I'm going with this comment, Perry. But those Macabeats. They are cute, aren't they? Glad to warm your heart, Carrie. I don't know where you were going with that comment either, but I appreciate it.